You can hardly find a user that has never run into data loss during its computer life. Well, a faulty floppy is one story, but what about a broken HDD? Causes for such unpleasant surprise may be too many, starting from wrong device handling, power outages in the mains, and ending with vendor defects. Full version of the article is yet available only in Russian. Article on-line version on The Business Week newspaper's site. Sometimes an HDD fails, and all data from it may disappear for good. The vendor will surely replace the HDD, provided that the warranty is still in effect. But that unlikely will make the user happy when its gigabytes of data are gone. An interview with a famous Russian data reincarnator, Mikhail Artemyev, the chief of the Repair Department in SoftJoys. If you believe that an HDD that fell from the second floor can be repaired just next door, you believe wrong. For example, that almost cannot be done in Moscow. But there is always a way out. An emergency, like Vogon, exists in Russia, too: this is SoftJoys, a firm from St. Petersburg, which has a 7 year experience in that area. 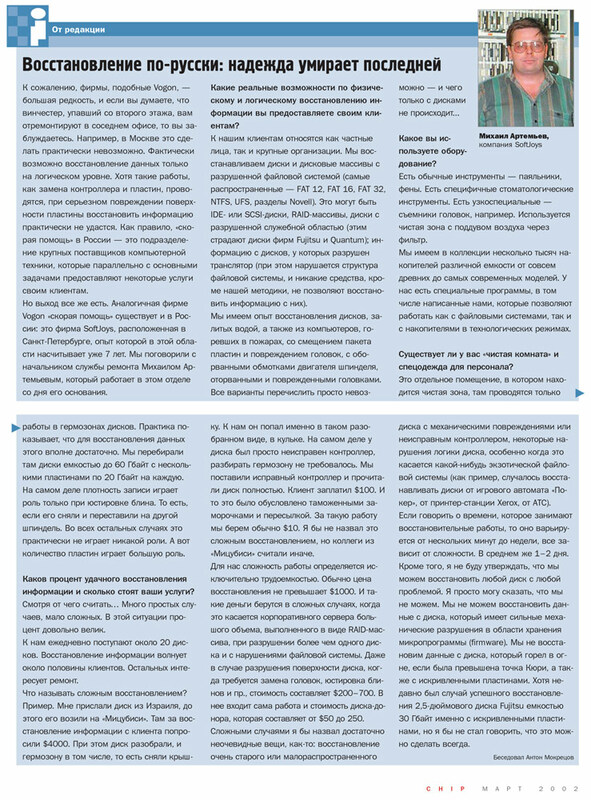 On-line version of the article on the CHIP-Russia magazine site. Magazine issue in the PDF format. Among all devices necessary for a computer to work, a total disaster for the computer owner could happen only when an HDD fails. The HDD stores all the data that an average user works with. HDD vendors provide no guarantee whatsoever for their safety. In Russia, an elite caste of high-profile professionals retrieves data from "dead" HDDs.